Great StuffWordPress community is growing with the rapid speed and nowadays, there is a big topic came in the conversation everywhere – twitter, facebook. Yes, I am talking about Gutenberg, the new WordPress Editor. WordPress core team already announced a schedule for the WordPress 5.0 and finally, first release candidate will available on 19th November 2018. So, start exploring new Editor and create your development sites ready with the Gutenberg compatibility. Gutenberg totally revamped with the block structure where you need to select a block to add, edit and delete. Ohh.. you might be thinking about your next Gutenberg friend that will give you a bundle of blocks? Blocks Kit makes it that much easier to select different blocks to design your post and pages, customizing the design however way you like. That brings 10+ custom blocks with a unique concept where you can choose any of it and customize it with your requirements like color, font-size, etc. In past with the below WordPress 5.0 version, you have to do stuff manually and have to understand the flow of the shortcode and its visual output on front-end. Luckily, those days are over – thanks to Gutenberg. I think this basic kit is enough to create, design and explore new Gutenberg Editor. Still thinking to select perfect block plugin? Let’s see some of the reviews from our existing customers. Great Start, a good plugin to use!!! Read all other 5-Star reviews on the wordpress.org via this link. Techeshta’s Blocks Kit gives you the design flexibility to create and fine-tune your WordPress posts and pages visually. This saves your time and considerably reduces the time it takes to go from an idea you have to a live and fully-functional WordPress website. 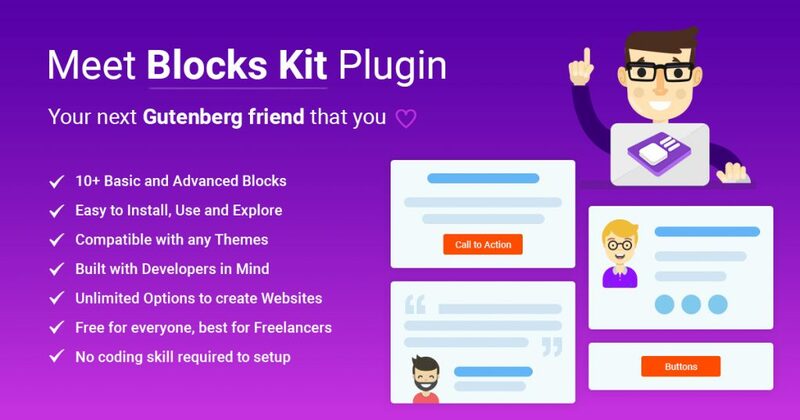 That’s why Blocks Kit will be your next Gutenberg friend.